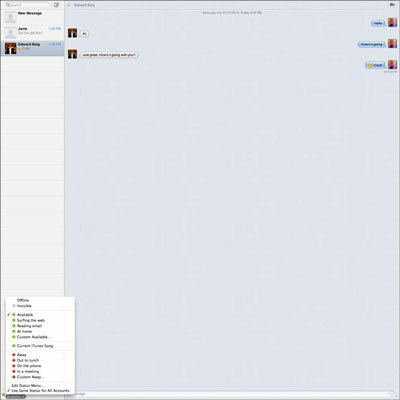 Messages, formerly iChat, is the instant messaging (IM) feature in Mac’s Mountain Lion. 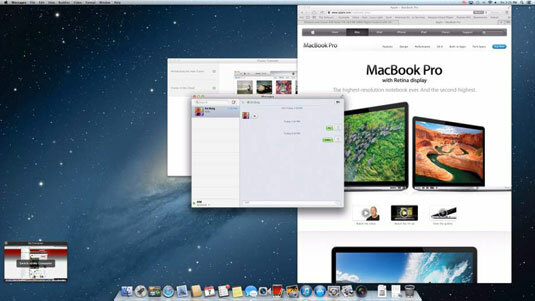 Instant messaging conversations on your Mac occur in real time, using your choice of text, voice, or video. 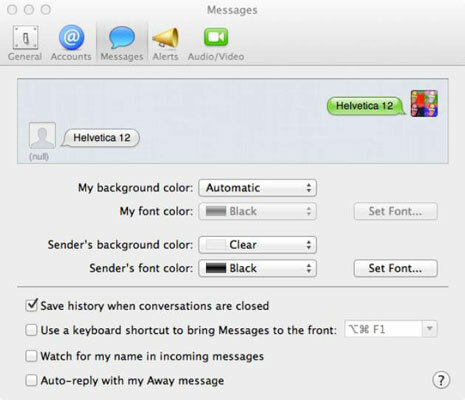 Here’s a list of 8 amazing things you can do in Messages. 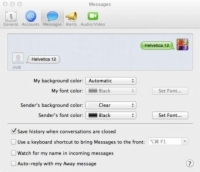 The iMessage component of Messages lets you send and receive text messages on your Mac, iPhone, iPad, and iPod touch with folks who have one or more of these devices. They’ll either get your message on their mobile device or the next time they open Messages on their Macs. With Messages, you can also send SMS or text messages to other phones and tablets. Messages allows you to import your contacts from AIM, Google Talk, Yahoo! Messenger, or Jabber IM, and use those contacts to have a chat. You may or may not be able to use all of Messages features (such as group chatting or sharing files) on these other instant messaging services, however. To create a record of your conversations, select Preferences on the Messages menu. Click the Messages tab and then select the Save History When Conversations Are Closed check box. You can find the appropriate transcript by searching Finder for “chat transcript” under Kind. To wipe away the record, choose Edit on the menu bar at the top of the screen and then choose Clear Transcript. With Messages, you can conduct an audio-only conference with up to nine other people. Video conferences are limited to three other people. Either way, your IM buddy has the option to accept or decline the conference invitation. You can record video chats and share them on your iPod, iPhone, iPad, Sony PSP or a variety of other devices. Choose Video→Record Chat. Don’t worry: A chat can’t be recorded without your permission. To stop recording a chat in progress, click Stop or close the chat window. 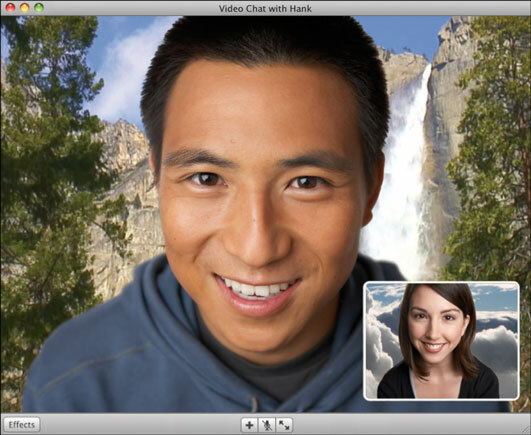 During video chats, you can share iPhotos, web pages, applications and such by clicking the + at the bottom of the screen. To share a file, select the Share a File with Theater check box and choose the relevant file from the dialog box. To share photos, select Share iPhoto with Theater and then select the pictures you want to share. You can present an album as a slideshow, provided that you have a recent version of iPhoto. 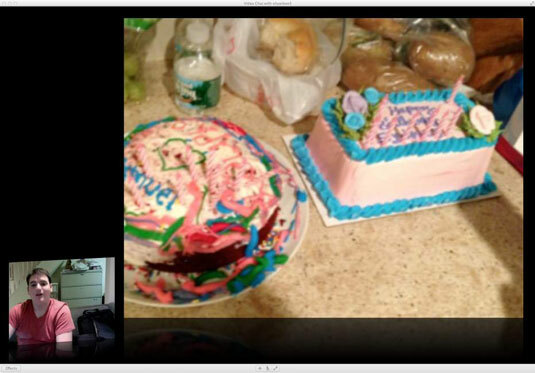 The person doing the sharing has video controls that dictate how the slideshow is being seen at the other end. To share a web page, select the Share a Webpage with Theater and enter the URL to share. To share an application such as Keynote, select the Share an Application with Theater and pick the app from the list. To share another file, select Share a File with Theater and choose the appropriate file to share. 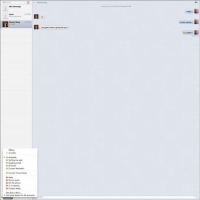 Click the X in the upper-right corner of the chat window to stop sharing. Rest assured that you can politely decline if you’re the one being asked. After sharing starts, you can each freely run amok on the shared desktop, even copying files by dragging them from one desktop to the other. Messages keeps an audio chat going so that you can let each other know what you’re up to. To end desktop sharing, press Control+Escape to or click the X to close.